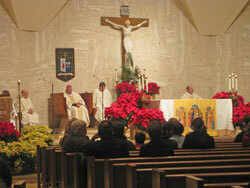 Here’s a picture from midnight Mass at the Cathedral of St. Joseph with Bishop John Raymond Gaydos celebrating. Our family has been going to midnight Mass for a number of years now. Then we come home and open presents and have a very early morning breakfast. It was nice having all my daughters home. I hope that you and your families all have a very blessed day too. The text from the Pope’s last general audience of the year prompted me to write today. I realize how much I’ve neglected this website and have used the excuse that I am working too hard and don’t have time. The Advent season is supposed to be one of personal reflection and that has allowed me to notice how much more I can be doing to evangelize. That’s actually why I started Path To Holiness in the first place? “Unfortunately, under the drive of a hedonist consumerism, Christmas runs the risk of losing its spiritual meaning, reduced to a mere commercial occasion to buy and exchange gifts. Actually, however, the difficulties, uncertainty, and the economic crisis that many families are living in these months, and which affects all humanity, can truly serve as a stimulus for rediscovering the warmth of the simplicity, friendship, and solidarity that are the typical values of Christmas. Stripped of its materialist and consumerist trappings, Christmas can become the opportunity to welcome, as a personal gift, the message of hope that emanates from the mystery of Christ’s birth”. Hedonistic consumerism are the words that stood out for me. Our work utilizes computers, cameras, audio and video recorders, iPods, microphones, etc. Many look at them as gadgets. I look at them as cool tools and am blessed to be able to use them to make a good living. However, it’s easy to want the next best thing just for the sake of having it too. Something we all need to be careful about.